What's Better? Active or Passive Monitoring or Both? Home/Passive Monitoring/What’s healthier for network performance monitoring? Active or Passive Monitoring or Both? At NetVelocity, we believe both are complementary technologies, CSPs should be using both for an overall greater customer experience. In the telecommunications industry, there are two types of monitoring that are often touted to rule their respective sectors and are considered to ensure better performance of the communications networks: active testing and passive testing. Discussions have been prevalent presenting both as either a choice or one better than the other. We at NetVelocity believe that both the technologies are complementary, and that telecom operators shall use both active and passive monitoring to identify the entire picture of the overall network performance so as to understand the experience of the end-users. Since it is real-time in nature, active monitoring is often accredited and is popularizing. However, it is an imperative feature to facilitate the network operators to distinguish the quality of experience (QoE) so as to compete with the progressively complex mobile networks. NetVelocity’s Active Monitoring tracks the network activity of the end-users and applications at regular intervals thereby determining the metrics such as response time and key performance indicators (KPIs). Both active and passive monitoring are complementary technologies and both have their own advantages respectively. Passive monitoring endures playing the role of managing wireless networks and offering historical data for predictive analytics. And with the ever-increasing complex nature of mobile networks nowadays, CSPs also necessitate the use of active testing for its real-time, proactive and automated quality of experience (QoE) analysis. 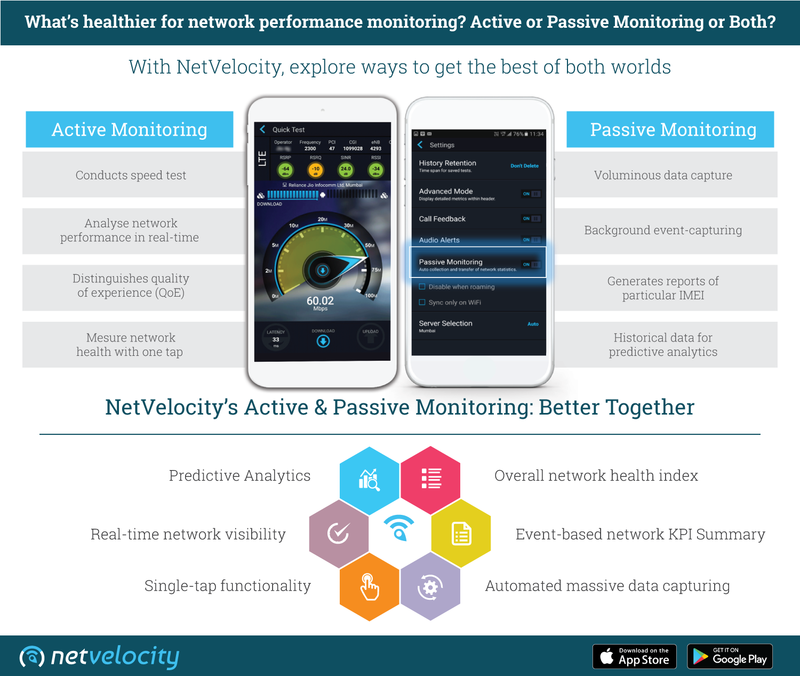 For complete performance assurance as well as competitive differentiation, NetVelocity’s Active and Passive Monitoring is imperative and are better together.